Noa's entire life has changed. Her older sister died in an accident. Her mom is depressed, and both of her parents are too worried to let her board at school so now she's commuting and further from her friends than ever. Her escape is her poetry, which she's kept secret from everyone. Then she meets the new boy at school, Callum. He's strangely hot and cold. Fans of urban fantasy YA will be totally shocked to learn that he's a supernatural creature who is dangerous to Noa. Things seem to be going pretty well, however, until Callum's younger brother Judah shows up. Judah has used a dangerous magic to come to the human world, one that will cost many lives. In SHATTERED BLUE, Lauren Bird Horowitz sets up a good brother-bad brother dichotomy and hints from the very beginning that which is which might not be obvious. By the end, I was convinced that both of them were bad. In addition to Callum and Judah, Noa also has a best friend Miles who is obviously interested in her even though he's never made an effort to ask her out and just gets jealous when she dates someone else. Three love interests and I wasn't invested in any of them. SHATTERED BLUE does have its strengths. Noa's family life is a true highlight. Her little sister Sasha is a gem, and I liked the perceptive aunt who comes to help the family out while they're grieving. I loved the way Noa's mom connected to her daughters and the painful way they found each other through the ghost of Isla. Noa's dad was less of an entity in the story, but he had a few good moments. It's rare to see a teen character with such a lived-in, present family and I thought it was an excellent part of the story. I thought Horowitz also did a good job of creating a consistent mythology. Her Fae don't appear to come from a particular tradition, but their powers were clearly defined. There's also some complicated politics going on, and secrets on top of secrets. I mostly thought the biggest reveal was well done, except for one completely stupid moment that let the air out of the entire climax. It was a bum note that didn't really fit the characterization or anything other than providing a plot for the second book in the Light trilogy. 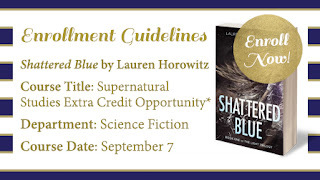 I thought SHATTERED BLUE had (multiple) underdeveloped romances and a few false notes here and there, but that it also had some elements that helped it stand out from the YA urban fantasy mold. The beginning of SHATTERED BLUE reads almost like a contemporary, and that's telling, because that side of the story is where the book really shines. I hope the supernatural side comes up to snuff in the next book.